STEEM/BTC testing the 7s and still in search of a turnaround.steemCreated with Sketch. Bottomline: I do not believe this is the bottom as there are still no signs of selling abating or sharp downward price action reflecting capitulation. I believe we will still need to head sharply lower to test 0.0005 levels and hopefully we will then see a meaningful rebound from there. 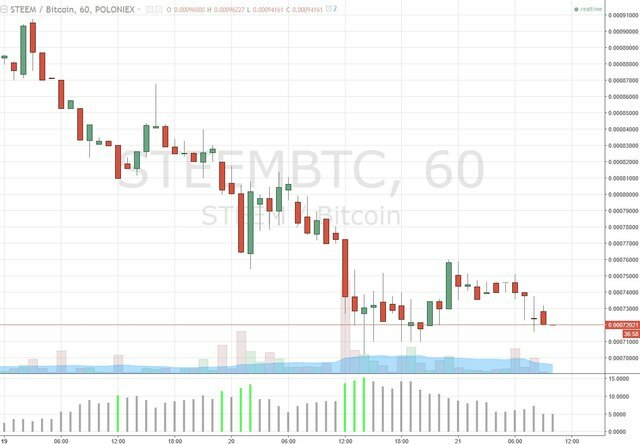 Bottomline: Though we see STEEM/BTC 0.0008 support level being re-tested and so far holding with a clear bullish divergence behind it, the inability to maintain a higher low yesterday is somewhat demoralising for longs. If we continue to see further reversals hence retesting this 0.0008 again, It should break through this support and head towards the 0.0005 levels next. In the event this happens as a sharp quick move, I will then be looking to establish a sizable long just above that support level. Well, indeed the 0.0008 support was restested and once it broke through, reaching the 7s took little effort. A short-lived bounce back to to 0.00076 was seen before it re-headed back down again to retest this level again. Direction & probability: There is currently a bull divergence emerging as a result of the multiple bottoms versus higher lows of both indicators, though this is still forming I would caution. 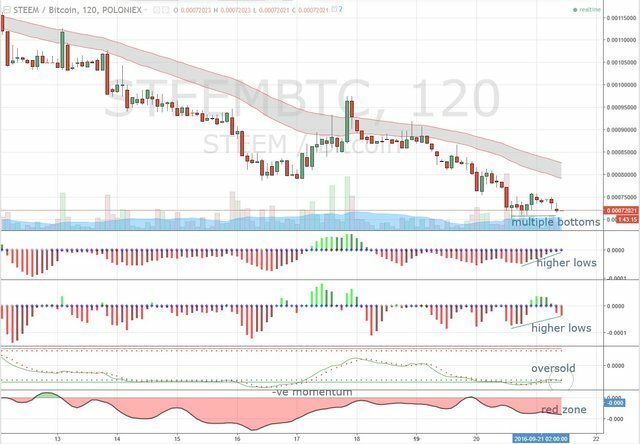 Steem has continued to tread tightly around the oversold boundary rather than being deeply oversold as one would expect by now while momentum still shows Steem to be in the red zone. Volatility indicators have not reflected any new green bars to indicate capitulation has occurred thus far. As such, this does not bode well for the strength of this emerging bullish divergence and may in fact be quite easily negated with just a moderate touch of additional selling. Resistance & Support: Near term support resides near the multiple bottom at 0.0007 levels though the stronger term support would be at 0.00052. Near term resistance levels would be the previous peak from last rebound at 0.00076 and 0.0008 after that. In terms of disclaimers: these are my own views based on price actions alone and I have tried my best not let any qualitative factors influence that view (there should be enough of those shared around steemit for anyone to form a perspective based on less quantifiable information). I will not be responsible for any trades that you may end up taking based on them. You are ultimately responsible for all your trading actions. In terms of disclosures: I currently have a long STEEM/BTC position which i may add to it when signs of capitulation based on chart signals emerges.